Yves here. American companies are still playing games to avoid reporting profits in the US. This does not mean that they are keeping cash offshore. One of the biggest companies using clever tax structuring to avoid minimize reported US profits, Apple, which managed to get a special deal with Ireland that allowed it to report corporate profits nowhere for tax purposes, kept the cash related to its Irish sub in banks in the US and managed it out of an internal hedge fund in Arizona. The outcome the article laments is no surprise. The last time the US gave a tax holiday to allow multinationals to repatriate profits, they used them to pay execs bonuses and buy back stock, and then returned to business as usual. When the GOP tax bill was enacted in 2017, President Trump promised that the United States would become a magnet for new jobs as trillions of repatriated dollars found their way home. But apparently, many companies that have stashed trillions of dollars abroad did not get the memo. Last year, corporate America brought back just $664.9 billion of offshore profits, or just 16.6 percent of the $4 trillion Trump said they would return as a result of the tax overhaul. More worryingly, the languid pace of repatriation has gotten progressively weaker as the quarters roll on, with fourth quarter repatriations clocking in at just $85.9 billion compared to $579 billion recorded for the first three quarters according to Department of Commerce data. You can trust wily American companies to figure out a way to keep as much of their profits as possible away from Uncle Sam’s reach. The new tax law was primarily designed to use a carrot and stick approach to nudge companies to bring back their offshore profits to the country. The carrot: corporate tax was lowered from 35 percent to a more manageable 21 percent. The stick: the US government now taxes all profits accumulated overseas, regardless of where the money is held. Under the old rules, companies were allowed to defer US taxes until they repatriated the money. Incredibly, Congress failed to anticipate a major loophole when it decided to charge US companies an even lower 10 percent corporate tax for profits earned abroad. Clearly, the lawmakers underestimated the labyrinthine workings of corporate tax for international companies. The tax avoidance guardrails put in place in the new territorial system don’t seem to be working. The result: American companies have been shifting their profits to low-tax jurisdictions to lower their tax bills even further. You can clearly see that in the chart belowwhereby reinvested foreign earnings have suddenly shot up. The second chart below shows that plenty of money has moved out of Ireland, a major host of European hubs of US tech and pharma companies such as Apple Inc. and Pfizer Inc. to low-tax territories like Cayman Islands and Luxembourg. And companies are not apologetic about it either. Last year, drugmaker Abbvie Inc. told shareholders that its tax rate would fall to just 9 percent from 22 percent previously due to a change in the territorial system. Abbvie happens to be a grandmaster when it comes to shielding its profits in tax havens, routinely reporting zero profits in the US despite most of its research facilities being based in the country. Pfizer, Boston Scientific Corp. ,Microsoft Inc. Synopsis and Expedia Group are all pros at the game, too. This bunch, however, have nothing on Amazon Inc. The ecommerce giant not only managed to pay zero tax on its massive $11.2 billion corporate income for 2018, but was even able to claim $129 million in rebates thanks to loopholes in the new tax law. Video streaming company, Netflix Inc., also managed to get away scot free despite posting a record profit of $858 million. Still, an extra $700 billion flowing into the economy in a year is hardly chicken feed. So, has the money being used to create more jobs as Trump hoped? Hardly. The evidence suggests that majority of that cash has simply found its way into buybacks with minimal discernible impact on investments. 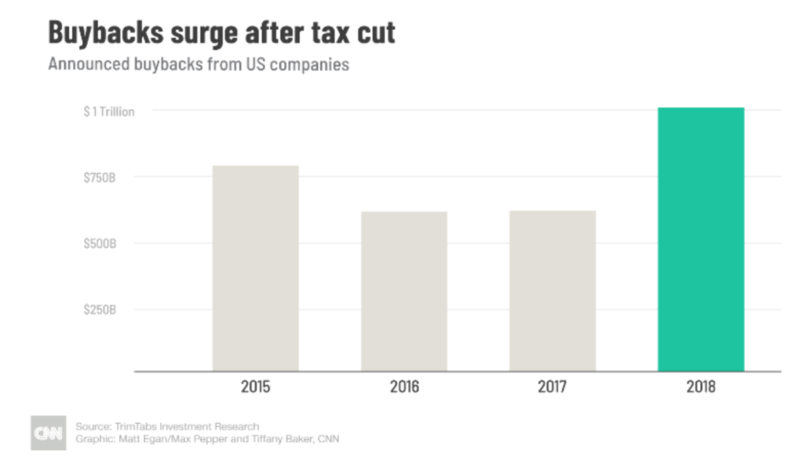 It’s probably not a coincidence that the generous tax cut has been followed by record buybacks, with companies repurchasing more than a trillion dollars-worth of their own shares last year. Ironically, Congress now wants to tame the monster it has helped create by reining in on buybacks. But with fears that a market top could be near, the timing would be wrong since buybacks provide a large source of demand for shares. 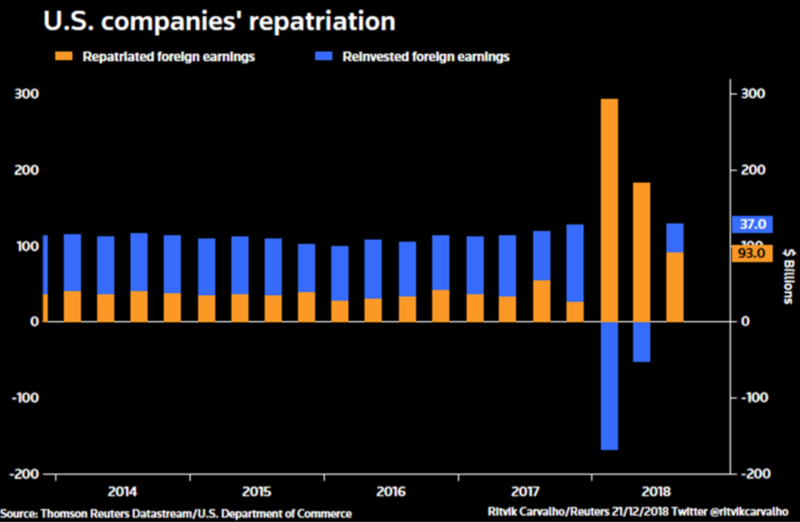 Further, lawmakers probably don’t have to worry too much about hefty buybacks if the current trajectory for repatriations is any indication. Huh? Its not a bug, its a feature. American companies are trying to tell us they are demand driven and they won’t invest in expansion until they can see the demand in the system to make it worth their while. How would an open, globalised world work against the West and in favour of the East? The 1% would get better returns from investing their capital in the rapidly growing Asian economies than the mature economies of the West. Multi-national corporations could make higher profits in Asia due to the low cost of living that they had to cover in wages. The West never did work out what was going on, but now the more developed Eastern economies are seeing the same thing and are looking into it. Higher returns on capital are affecting their economies as they off-shore to places where they can pay lower wages for higher profits. Richard Koo asked American firms where they are expanding their capacity. They said it was in Mexico as it’s cheaper and they can make more profit. To maximise profit you need to minimise labour costs, i.e. wages. The minimum wage leaves no disposable income. Employees get their money from wages and employers have to pay the US cost of living in wages unless they off-shore to somewhere cheaper, like Mexico. The developed Eastern economies are now finding they are in same situation as the West has been for the last few decades and they are coming up with explanations and solutions, unlike our own experts. Always respected Richard Koo’s POV from early in GFC. Lastly, if ROC is too low in developed countries such that emerging market investment, AI and robots are TINA for big biz, then it follows M4A, wage replacement and other socialist policies based on MMT are possible, perhaps even necessary to support our economy and avoid collapse. Fed policy normalization is what caused the debt bubble in 2017-18. I am amazed people still don’t get it. The American people should be screaming about the fact most of these corporations barely pay any taxes at all to keep this country running. But silence. Why is there such slavish loyalty to corporations by Americans when most aren’t even employed by them? Then you will know who benefits, and is paid the most, by these selfsame corporations. Well that is twice now that corporate America has repatriated hundreds of billions from overseas and each time, so far as I know, it was used for stock buybacks, executive bonuses, vanity projects, etc. Not for investment, not for research, not for up-skilling their workforce or expanding their operations but just playing Wall Street games. I would judge that before trying to go after all this money overseas, that it will be necessary to impose a working taxation system on corporate America first. To earn over $11.2 billion in tax but to not only not get taxed but to earn a rebate illustrates how broken the system is. At the moment, the corporate tax rate is supposed to be 21% so perhaps they can bring out a tax on gross corporate income of 21% – but with no rebates or anything at all that can be taken from this amount. Just a flat out tax. By my calculations, Jeff Bezos thus owes the US government $2,352,000,000 in taxes. I’m sure that a cheque from him would do just fine. “Duh” is fewer key strokes than “quelle surprise”, but it’s not as classy. May I take a stab at John’s question? I’d say that Americans show their corporate loyalties most constantly by their retail purchasing, which is by and large carried on now at or through corporate-controlled outlets. The items purchased often carry corporate brands. They are either designed or produced by corporate interests, or imported by them upon manufacture outside the country to their specifications, through corporate-owned jobbers and wholesalers in a process guided by corporate lawyers. They often pay for their purchases using corporation-issued debit or credit cards. Americans may chafe at displaying such loyalties, but they have about as much chance of avoiding doing so as they might of remaining seated at a football game during the national anthem. Immense opprobrium attaches to even the least hint of dissatisfaction with the way things work. There is a kind of manufactured consent in play here: we consent to remain loyal, or at least to keep up an appearance of doing so. The prevailing American system both requires loyalty and creates that loyalty even as it punishes disloyalty. In that sense I’d say that “slavish” is indeed the right adjective to describe it, since there would appear to be little or no genuine voluntarism behind it. You’re onto something there. Perception management goes way back. Almost 100% of those who are forced to put money in 401Ks will be ‘slavishly’ devoted to the stock market being up all the time. They check their 401K portfolios on a weekly basis. When Wall Street pushed through the conversion of defined benefits to defined contributions and also decimated pension plans, they completely changed the mindset of the working class. It is now more than silly to go and ask someone if they support more taxes on Amazon, Apple and Pfizer when their 401K portfolio contains all these shares. It was the master ‘heads I win, tails you lose’ trick. It will be a monumental task to remove this advantage that the 1% and Wall Street have, viz, make people ditch 401Ks and move back to a traditional pension plan. As a late Romanian friend of mine would say when wealth was behaving badly.